The Catholic Church in America has begun its third annual Fortnight for Freedom calling on Catholics to pray and fight for freedom, especially religious freedom. The event will begin on June 21 and end on July 4. 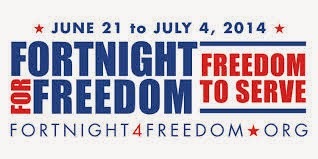 See the link below or contact your parish/diocese to learn more on activities planned for this Fortnight for Freedom 2014.